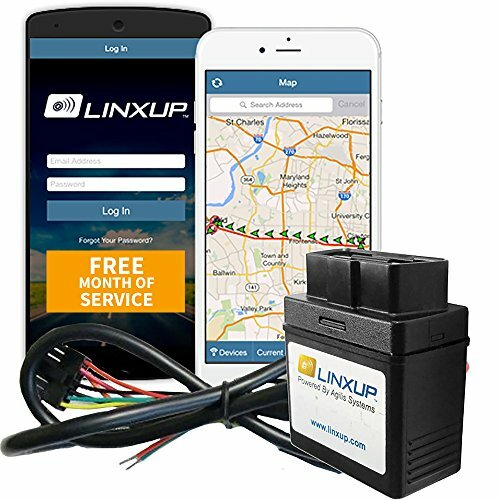 Linxup is a 3G GPS tracking device for companies, fleets, and personal vehicles. Use Linxup GPS trackers to quickly identify driver locations, reduce FUEL usage, increase efficiency, review driving history, and monitor driver safety & performance. The Linxup GPS system makes it easy to take advantage of powerful GPS tracking capabilities. This wired Linxup GPS tracker should be installed under the vehicle dashboard with three simple wires. The web-based GPS software lets you track vehicles in real-time and review driving history on an interactive Map with vehicle GPS details on direction, speed, stops, and more. Linxup GPS trackers also have a native mobile app for iOS and Android. Monitor driving activity and the location of your tracking device even when you're not in the office. Activate 3G vehicle tracking service within 30 days of purchase to receive a free month of service, a dollar 22.99 value! Built-in GPS tools allow you to monitor safe driving habits such as speeding, harsh braking, and rapid acceleration; text and email Alerts tell you when a driver speeds, brakes abruptly, accelerates rapidly, tampers with a GPS tracking device, or uses a vehicle outside of authorized hours. The GPS system creates a driver safety report card that summarizes and rates each driver's activity and compares it with the other drivers in your fleet. The GPS system also allows you to track and monitor vehicle maintenance activities over time. Set up geofences (virtual boundaries on the Map) to identify important locations and monitor when your GPS vehicle tracker enters or exits these locations. Linxup GPS trackers can reduce FUEL usage in your vehicles by as much as 20% per month by monitoring and coaching your drivers to reduce speeds and eliminate unnecessary vehicle idling. What are you waiting for? Get Linxup GPS trackers and start saving today! activate 3G vehicle tracking service within 30 days of purchase to receive a free month of service, a dollar 22.99 value. Review driving routes with GPS Tracking, set geofences around important driver locations (jobsite or restricted areas) and know when the vehicle is in use with the Linxup GPS vehicle Tracking Device. Use Linxup valuable reports and dashboard to reduce your fleet's fuel consumption and monitor driver safety. Make more service calls and reach more customers each day. Free GPS tracking mobile apps with unlimited real-time email & text message alerts. Tracker installs discreetly under the dashboard with three wires and includes manufacturer's lifetime warranty. If you have any questions about this product by Linxup, contact us by completing and submitting the form below. If you are looking for a specif part number, please include it with your message.